Japan is releasing the Revised Industrial Production m/m data along with the US publishing Federal Funds Rate, FOMC Statement, Crude Oil Inventories, Business Inventories m/m, Core Retail Sales m/m and CPI m/m therefore USDJPY will be chiefly under the influence of the economic reports in the US. The support rests at 109.890 with resistance at 110.210 which the weekly pivot point at 110.080 is located in between the lines. The EMA of 10 is moving with bearish bias along the descendant channel and it is below the EMA of 100 and above the EMA of 200. 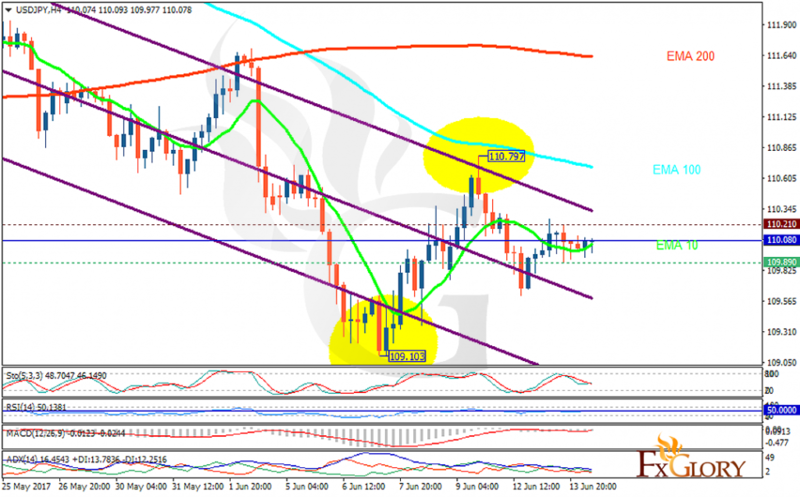 The RSI is moving on the 50 level, the Stochastic is moving in middle ranges and the MACD indicator is in neutral territory. The ADX is not showing any clear signals. Short positions are recommended targeting 108.